10843 W Waterfront Ln, Nine Mile Falls, WA.| MLS# 201914075 | Cooper Realty Services (509) 599-1111 | Spokane WA Real Estate | Contact us to request more information about our Homes for Sale in the Spokane WA area. 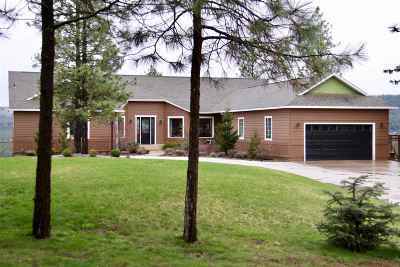 This must see ranch style home! Spend your evenings watching beautiful sunsets right from your back porch with this 180 degree view! This 4 bed, 4 bath home was has been fully updated with Huntwood 10&apos; custom floor to ceiling kitchen cabinets, granite, heated floors in bathrooms, Thermador appliances, and 2nd master downstairs. Great for entertaining with a daylight basement. Large 2nd family room downstairs w/wet bar for entertaining. Also additional office or non-egress bedroom.Super high bank waterfront.